1. 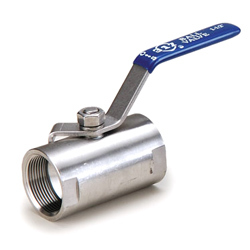 Bar stock 1-pc ball valve. 2. Screwed end to BS21, ANSI B2.1 DIN-259. 3. Reducing bore. 800 wog. 1. Body: AISI 316 / AISI 304. 2. Size: 1/8"~2". 3. Screwed end to BS21, ANSI B2.1 DIN-259. 4. Bar stock 1-pc ball valve. 5. Reducing bore. 800 wog.